On Wednesday, July 18, the feast day of the Holy Venerable Martyrs Grand Duchess Elizabeth & Nun Barbara, the sisters of St. Elizabeth Skete in Jordanville, NY celebrated their patronal feast day. 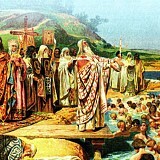 The epistle of His Holiness, Patriarch Kyrill, and the Holy Synod of the Russian Orthodox Church to the archpastors, clergy, monastics, and laity on the occasion of the 1,030th anniversary of the Baptism of Rus’. 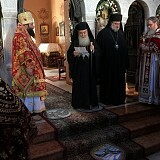 On Monday, July 23, after a brief illness, Archpriest Stephanos Shagoury reposed in the Lord. 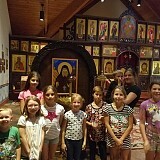 St. Mary of Egypt Church in Roswell (Atlanta), GA held its 11th annual summer camp during the week of July 16-20 for children aged 4-16. 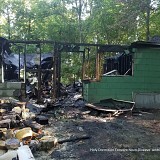 On Wednesday morning, July 18, a fire broke out in the candle factory of Holy Dormition Convent "Novo-Diveevo" in Nanuet, NY. 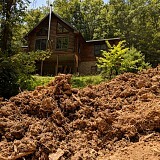 The building was completely lost but no one was hurt. On Wednesday, June 18, the feast of the Venerable Nun-Martyrs Grand Duchess Elizabeth and Barbara, St. Elizabeth the New-Martyr Church in Rocky Hill, NJ celebrated its patronal feast day and the 20th anniversary of the parish’s founding. 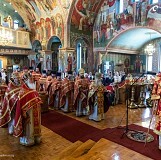 On Tuesday, July 17, an exhibition commemorating the 100th anniversary of the death of Tsar Nicholas II and his family opened at the Russian History Museum on the grounds of Holy Trinity Monastery in Jordanville, NY. 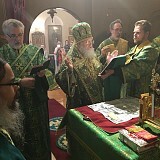 On Wednesday, July 18, the feast of the Finding of the Relics of Venerable Sergius of Radonezh, Metropolitan Hilarion of Eastern America & New York led the patronal feast day of the English Mission at St. Sergius Chapel in the Synodal Headquarters in New York City. On Wednesday, July 18, the feast day of Venerable Sergius, Abbot & Wonderworkerker of Radonezh, the Heavenly patron of the murdered Grand Duke Serge Alexandrovich, and also the 100th anniversary of the martyrdom of his widow, the Holy Grand Duchess Elizabeth Feodorovna, Nun Barbara (Yakovleva). 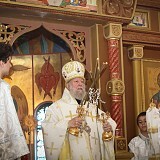 On Saturday, July 7, the feast of the Nativity of the Holy Prophet, Forerunner, and Baptizer of the Lord John, Metropolitan Hilarion of Eastern America & New York paid an archpastoral visit to St. John the Baptist Cathedral in Mayfield, PA, where he led the parish’s patronal feast day. 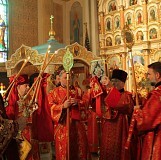 On Monday, July 9, the feast of the Tikhvin Icon of the Mother of God, Metropolitan Hilarion of Eastern America & New York arrived at the Diocese Center in Howell, NJ where he led the patronal feast day of Our Lady of Tikhvin Church. 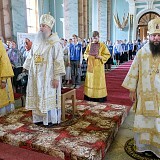 On Thursday, July 12, the feast day of the Heavenly patrons of St. Petersburg – the Holy Leaders of the Apostles Peter & Paul, Metropolitan Barsanuphius of St. Petersburg & Ladoga led the patronal feast day of the cathedral in Peter & Paul Fortress. 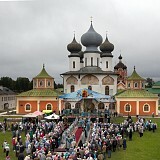 On Monday, July 9, the feast day of the Finding of the Tikhvin Icon of the Mother of God, Metropolitan Barsanuphius of St. Petersburg & Ladoga celebrated Divine Liturgy in the Monastery of the Dormition of the Mother of God in Tikhvin, Russia. 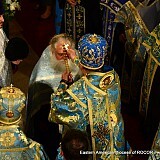 On Sunday, June 1, Metropolitan Hilarion of Eastern America & New York celebrated Divine Liturgy in the Synodal Cathedral of the Sign in New York City. 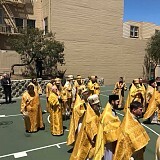 At the invitation of Archbishop Kyrill of San Francisco & Western America, Eastern American Diocesan vicar Bishop Nicholas of Manhattan took part in the celebrations in honor of the feast day of the Holy Hierarch John, Wonderworker of Shanghai & San Francisco.